Noctua today introduced NT-H2, the second generation of its hybrid thermal compound. Combining the NT-H1’s proven features, ease of use and long-term stability with a fine-tuned formula of microparticles, NT-H2 is an enthusiast-grade paste. At the same time, Noctua also presented a large 10g pack of NT-H1 as well as NA-SCW1, a set of 20 cleaning wipes that are ideal for removing thermal compound in a quick, clean and efficient manner. NT-H2 uses a new mixture of metal oxide microparticles for lower thermal resistance and reduced bond-line thickness at typical mounting pressures. In Noctua’s standardised internal testing at various platforms and heat loads, up to 2°C lower temperatures were attained. NT-H2 thermal compound does not require a break-in period and due to its long-term stability, it can be used on the CPU for up to 5 years. Both pastes are electrically non-conductive and non-corroding, so there is no risk of short circuits and they’re safe to use with all types of heatsink. NT-H2 thermal compound will come in standard 3.5g and extra-large 10g packages that include three (3.5g) and ten (10g) NA-CW1 cleaning wipes for easy cleaning. Pre-moistened with a custom detergent mixture, these wipes are ideal for cleaning CPUs, GPUs and the contact surface of heatsinks in a quick and efficient manner. For enthusiast users who take off and install their coolers frequently, the NA-CW1 wipes are also available separately in a set of 20 (NA-SCW1). In addition to the new NT-H2 and NA-SCW1 cleaning wipes, Noctua also introduced a 10g package of NT-H1. 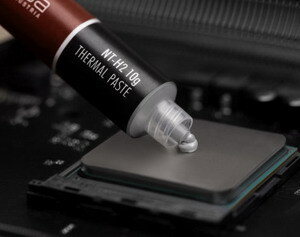 While, so far, the popular paste has only been available in a 3.5g package, the new 10g version is ideal for power users or for large processors such as AMD’s Threadripper (TR4) or Intel’s LGA3647 that require higher volumes of thermal compound.